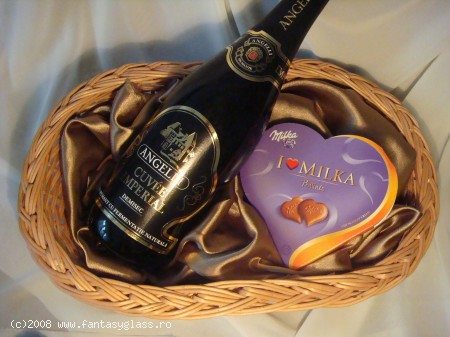 The most romantic combination of the finest champaigne and most delicate chocolate. Did you know? Champagne is a French sparkling wine, made in the Champagne region in the North East of France. The only wine that is legally allowed to be called Champagne is wine that has been produced in this region. The wine is a blend of up to three different grape varieties; Pinot Noir, Chardonnay and Pinot Meunier. Once the wine has aged, a certain amount of sugar is added, known as the dosage. A Champagne cocktail is the ideal way to toast your loved one. The little extras that turn sparkling wine into a cocktail add an extra romantic touch. Like wearing diamonds or pearls with denim, this favorite cocktail is great for a decidedly casual yet still stylish celebration. Use a beer glass or other glass large enough to hold a full pint easily. At the same time, slowly pour the Champagne and Guinness together into the same chilled glass.